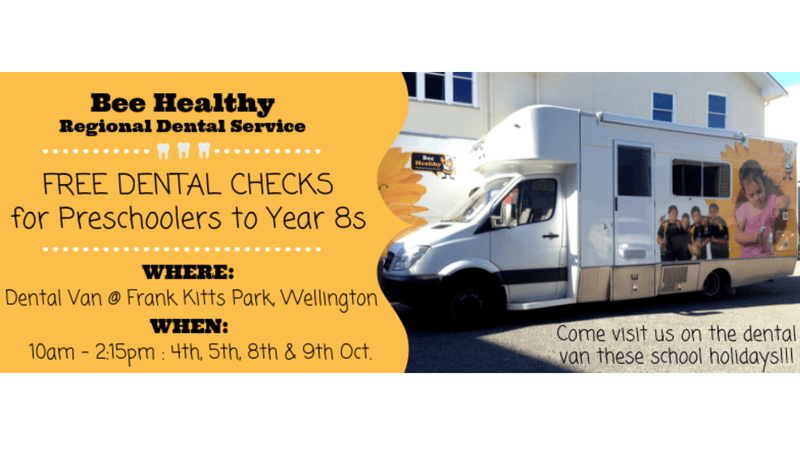 Bee Healthy Regional Dental Service will be at Frank Kitts Park, Jervois Quay, Wellington on Thu 4, Fri 5, Mon 8 & Tue 9 (weather permitting*) of October between 10am - 2:15pm offering free dental checks** for Preschoolers to Year 8 children, that have not had a dental checkup this year. *In the event of bad weather - cancellation notifications will be posted on the Facebook event page (https://www.facebook.com/events/2200118910267818/) the day beforehand. *To be eligible for free dental checks, your child needs to be enrolled with Bee Healthy Regional Dental Service. Bee Healthy Regional Dental Service also provide free dental checks by appointment for preschools at our Bee Healthy Dental Hubs, so if you are unable to make it to our drop-in van service, you can give us a call on 0800 TALK TEETH (0800 825 583) to book an appointment at your local Bee Healthy Dental Hubs.